There are a lot of DIY concoctions out there, so I sorta picked what I liked and ran with it. Some use just essential oils, but if you do not have them on hand already going out to find and buy them might not be something you want to do, and then you will be spending anywhere from $2 to $5 each. That being said and me already being in frugal love with the Dollar Tree I opted to go there for my scent. 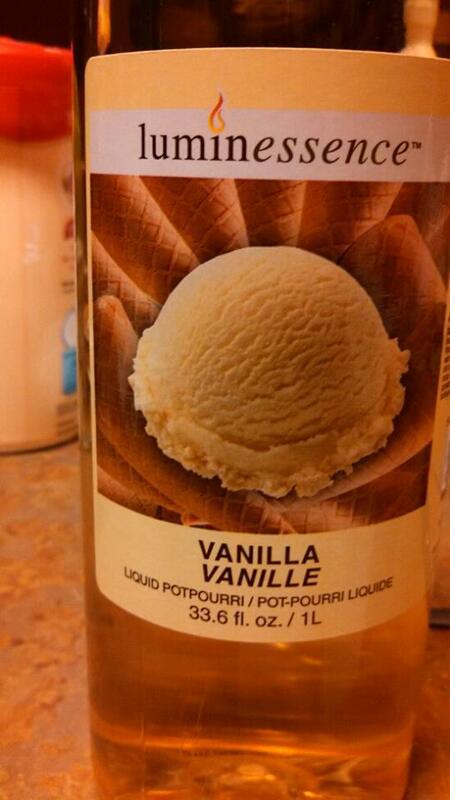 I picked up a bottle of Vanilla liquid potpourri. What else will you need? 1-3 empty containers depending on what you want to do with the mix. Optional: Decorative items to stick in, and food coloring if you want to make them colored. Bring water to boil, dissolve all gelatin and salt, move to other bowl or container and add the liquid potpourri. And that’s it! The whole process takes like 15 minutes tops! Choose your container – I had one with a lid that I wanted to use, I also had some small Ziploc containers and a mid size one. 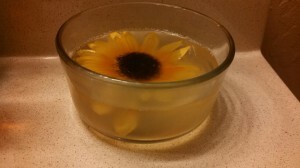 I wanted to make a pretty one so once the mixture had cooled I had some silk sunflowers in the closet and I put one in the middle. You can leave them out to harden at room temps or if you are like me you want to see them NOW, stick them in the fridge and tada, semi-instant gratification! 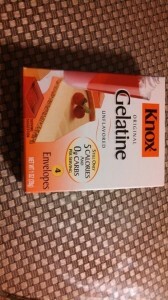 These will last for 4 weeks, the salt keeps it from molding. 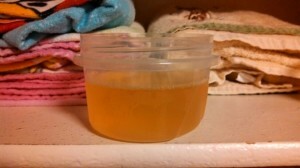 Some people add a splash of vodka for this purpose but we don’t waste liquor in this house, LOL. You can really run with this and make it your own. I’m making a new batch of this but this time at the end I’m adding a stick of cinnamon to make it vanilla cinnamon. Have beads? Sea Shells? Dry potpourri? You can jazz this up anyway you want and to match your decor. You can also add food coloring but I didn’t. 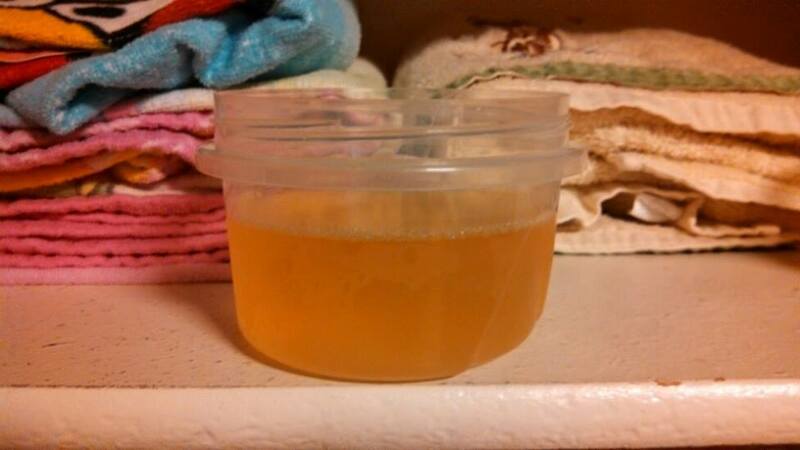 I wanted to make this as frugal as possible and then you decide what to do with what you have on hand. How much will you spend? 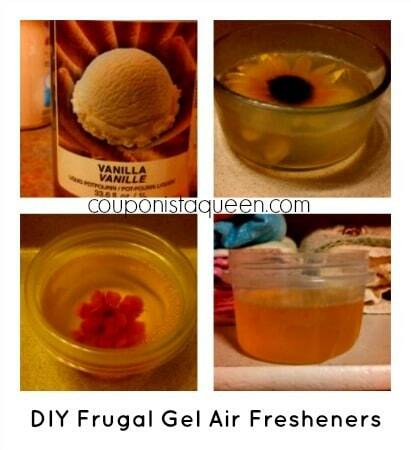 $1.48 for the Gelatin at Walmart or Target and $1 for a bottle of liquid potpourri at the Dollar Tree. Walmart also has the concentrated liquid potpourri for 97 cents in a tiny bottle that you can use and scent to your liking. 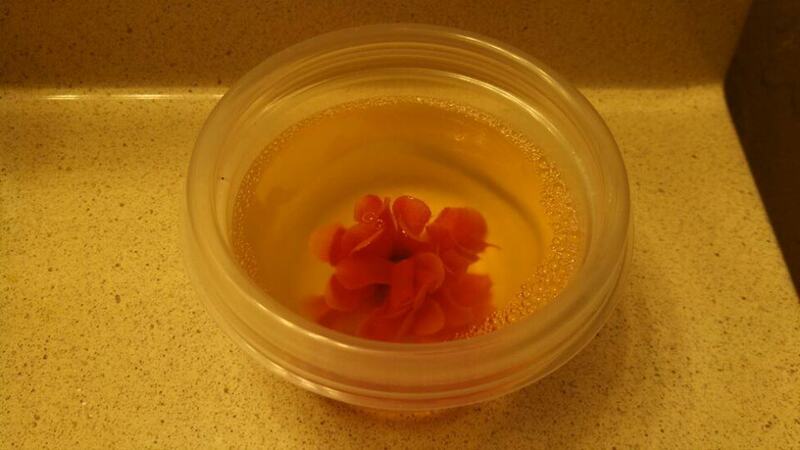 The bottle of potpourri will make two batches so your 2nd batch will only cost you $1.48 for 2 or 3 air fresheners depending on the size of container you use. I made a mini one for my desk. I am going to be honest with you I can not find my one hole puncher and I could not find one at any store this week ☺ But you take that and cover the air fresheners and poke a few holes in the lid to keep out fingers and cat noses and to let the scent escape. This is a great idea. New addiction here I come! Thanks for the post.